Ludwig van Beethoven's Symphony No. 5 in C Minor (Op. 67) was written in 1804–08. This symphony is one of the most popular and well-known compositions in all of European classical music, and one of the most often-played symphonies. It comprises four movements: an opening sonata allegro, an andante, and a fast scherzo which leads attacca to the finale. First performed in Vienna's Theater an der Wien in 1808, the work achieved its prodigious reputation soon afterwards. At the time, E.T.A. Hoffmann described the symphony as "one of the most important works of the age". It begins by stating a distinctive four-note "short-short-short-long" motif twice. The symphony, and the four-note opening motif in particular, are well known, and the motif has become a musical cliché. As a result, elements from the symphony have resurfaced numerous times in popular culture, from new renditions in other genres, such as disco and rock and roll, to appearances in film and television, and even on telephone answering machines. Beethoven was in his mid-thirties during this time; his personal life was troubled by increasing deafness. In the world at large, the period was marked by the Napoleonic Wars, political turmoil in Austria, and the occupation of Vienna by Napoleon's troops in 1805. Beethoven dedicated the symphony to two of his patrons, Prince Franz Joseph von Lobkowitz and Count Rasumovsky. The dedication appeared in the first printed edition of April 1809. The symphony soon acquired its status as a central item in the repertoire. As an emblem of classical music, as it were, the Fifth was played in the inaugural concerts of the New York Philharmonic on December 7, 1842, and the National Symphony Orchestra on November 2, 1931. Groundbreaking both in terms of its technical and emotional impact, the Fifth has had a large influence on composers and music critics, and inspired work by such composers as Brahms, Tchaikovsky (his 4th Symphony in particular), Bruckner, Mahler, and Hector Berlioz. The Fifth stands with the Third Symphony and Ninth Symphony as the most revolutionary of Beethoven's compositions. The symphony is scored for piccolo (fourth movement only), 2 flutes, 2 oboes, 2 clarinets in B-flat and C, 2 bassoons, contrabassoon (fourth movement only), 2 horns in E-flat and C, 2 trumpets, 3 trombones (alto, tenor, and bass, fourth movement only), timpani and strings. The first movement opens with the four-note motif discussed above, one of the most famous in western music. There is considerable debate among conductors as to the manner of playing the four opening bars. Some conductors take it in strict allegro tempo; others take the liberty of a weighty treatment, playing the motif in a much slower and more stately tempo; yet others take the three Gs and the E's 'molto ritardando' (slowing through each four-note phrase), arguing that the pause marks authorize this. The first movement is in the traditional sonata form that Beethoven inherited from his Classical predecessors, Haydn and Mozart (in which the main ideas that are introduced in the first few pages undergo elaborate development through many keys, with a dramatic return to the opening section — the recapitulation — about three-quarters of the way through). It starts out with two dramatic fortissimo phrases, which grab the listener's attention. Following the first four bars, Beethoven uses imitations and sequences to expand the theme, these pithy imitations tumble over each other with such rhythmic regularity that they appear to form a single, flowing melody. Shortly after, a very short bridge, (ff) played by the horns, takes place before a second theme is introduced. This second theme is in E-flat major, the relative major of the piece, and it is more lyrical, with a piano dynamic and features the four note motif in the string accompaniment. The codetta is based on the four-note motive. Following is the development, it uses modulation (key changes), sequences and imitation, the bridge is also featured in the development. After the recapitulation, there is a brief solo passage for oboe in improvisatory style, and a massive coda to finish the movement. The second movement, in A flat major, is a lyrical work in double variation form, which means that two themes are presented and varied in alternation. Following the variations there is a long coda. The movement opens with an announcement of its theme, a melody in unison by violas and cellos, with accompaniment by the double basses. A second theme soon follows, with a harmony provided by clarinets, bassoons, violins, with a triplet arpeggio in the violas and bass. A variation of the first theme reasserts itself. This is followed up by a third theme, thirty-second notes in the violas and cellos with a counterphrase running in the flute, oboe and bassoon. Following an interlude, the whole orchestra participates in a fortissimo, leading to a series of crescendos, and a coda to close the movement. The movement returns to the opening key of C minor and begins with the following theme, played by the cellos and double basses. The 19th century musicologist Gustav Nottebohm first pointed out that this theme has the same sequence of pitches (though in a different key and range) as the opening theme of the final movement of Mozart's famous Symphony No. 40 in G minor, K. 550. Here is Mozart's theme. (The derivation emerges more clearly if one listens first to Mozart's theme, then Mozart's theme transposed to Beethoven's key and range, then Beethoven's theme, thus. While such resemblances sometimes occur by accident, this is unlikely to be so in the present case. Nottebohm discovered the resemblance when he examined a sketchbook used by Beethoven in composing the Fifth Symphony: here, 29 measures of Mozart's finale appear, copied out by Beethoven. "The scherzo offers contrasts that are somewhat similar to those of the slow movement in that they derive from extreme difference in character between scherzo and trio ... The Scherzo then contrasts this figure with the famous 'motto' (3 + 1) from the first movement, which gradually takes command of the whole movement." The triumphant and exhilarating finale begins without interruption after the scherzo. It is written in an unusual variant of sonata form: at the end of the development section, the music halts on a dominant cadence, played fortissimo, and the music continues after a pause with a quiet reprise of the "horn theme" of the scherzo movement. The recapitulation is then introduced by a crescendo coming out of the last bars of the interpolated scherzo section, just as the same music was introduced at the opening of the movement. The interruption of the finale with material from the scherzo was pioneered by Haydn, who had done the same in his Symphony No. 46 in B, from 1772. It is not known whether Beethoven was familiar with this work. The Fifth Symphony finale includes a very long coda, in which the main themes of the movement are played in temporally compressed form. Towards the end the tempo is increased to presto. The symphony ends with 29 bars of C major chords, played fortissimo. Charles Rosen, in The Classical Style suggests that this ending reflects Beethoven's sense of Classical proportions: the "unbelievably long" pure C major cadence is needed "to ground the extreme tension of [this] immense work." A great deal has been written about the Fifth Symphony in books, scholarly articles, and program notes for live and recorded performances. This section summarizes some themes that commonly appear in this material. Schindler's testimony concerning any point of Beethoven's life is disparaged by experts (he is believed to have forged entries in Beethoven's conversation books). Moreover, it is often commented that Schindler offered a highly romanticized view of the composer. Thus, although we cannot know whether Schindler actually fabricated this quotation, it seems a strong possibility. There is another tale concerning the same motif; the version given here is from Antony Hopkins's description of the symphony (see References below). Karl Czerny (Beethoven's pupil, who premiered the "Emperor" Concerto) claimed that "the little pattern of notes had come to [Beethoven] from a yellow-hammer's song, heard as he walked in the Prater-park in Vienna." Hopkins further remarks that "given the choice between a yellow-hammer and Fate-at-the-door the public has preferred the more dramatic myth, though Czerny's account is too unlikely to have been invented." The key of the Fifth Symphony, C minor, is commonly regarded as a special key for Beethoven, specifically a "stormy, heroic tonality". Beethoven wrote a number of works in C minor whose character is broadly similar to that of the Fifth Symphony. "Beethoven in C minor has come to symbolize his artistic character. In every case, it reveals Beethoven as Hero. C minor does not show Beethoven at his most subtle, but it does give him to us in his most extrovert form, where he seems to be most impatient of any compromise". It is commonly asserted that the opening four-note rhythmic motif (short-short-short-long; see above) is repeated throughout the symphony, unifying it. According to Web, "it is a rhythmic pattern (dit-dit-dit-dot*) that makes its appearance in each of the other three movements and thus contributes to the overall unity of the symphony" (Doug Briscoe,); "a single motif that unifies the entire work" (Peter Gutmann,); "the key motif of the entire symphony"; "the rhythm of the famous opening figure ... recurs at crucial points in later movements" (Richard Bratby,). The New Grove encyclopedia cautiously endorses this view, reporting that "[t]he famous opening motif is to be heard in almost every bar of the first movement – and, allowing for modifications, in the other movements." In the second movement, an accompanying line plays a similar rhythm. In the finale, Doug Briscoe (cited above) suggests that the motif may be heard in the piccolo part, presumably meaning the following passage. Later, in the coda of the finale, the bass instruments repeatedly play the following. On the other hand, there are commentators who are unimpressed with these resemblances and consider them to be accidental. Antony Hopkins, discussing the theme in the scherzo, says "no musician with an ounce of feeling could confuse [the two rhythms]", explaining that the scherzo rhythm begins on a strong musical beat whereas the first-movement theme begins on a weak one. Donald Francis Tovey pours scorn on the idea that a rhythmic motif unifies the symphony: "This profound discovery was supposed to reveal an unsuspected unity in the work, but it does not seem to have been carried far enough." Applied consistently, he continues, the same approach would lead to the conclusion that many other works by Beethoven are also "unified" with this symphony, as the motif appears in the "Appassionata" piano sonata, the Fourth Piano Concerto, and in the String Quartet, Op. 74. Tovey concludes, "the simple truth is that Beethoven could not do without just such purely rhythmic figures at this stage of his art." To Tovey's objection can be added the prominence of the short-short-short-long rhythmic figure in earlier works by Beethoven's older Classical contemporaries Haydn and Mozart. To give just two examples, it is found in Haydn's "Miracle" Symphony, No. 96) and in Mozart's Piano Concerto No. 25, K. 503. Such examples show that "short-short-short-long" rhythms were a regular part of the musical language of the composers of Beethoven's day. While it is commonly stated that the last movement of Beethoven's Fifth is the first time the trombone and the piccolo were used in a concert symphony, it is not true. The Swedish composer Joachim Eggert specified trombones for his Symphony in E-flat major written in 1807, and examples of earlier symphonies with a part for piccolo abound, including Michael Haydn's Symphony no. 19 in C major composed in August 1773. In the autograph score (that is, the original version from Beethoven's hand), the third movement contains a repeat mark: when the scherzo and trio sections have both been played through, the performers are directed to return to the very beginning and play these two sections again. Then comes a third rendering of the scherzo, this time notated differently for pizzicato strings and transitioning directly to the finale (see description above). Most modern printed editions of the score do not render this repeat mark; and indeed most performances of the symphony render the movement as ABA' (where A = scherzo, B = trio, and A' = modified scherzo), in contrast to the ABABA' of the autograph score. The repeat mark in the autograph is unlikely to be simply an error on the composer's part. The ABABA' scheme for scherzi appears elsewhere in Beethoven, in the Bagatelle for solo piano, Op. 33, No. 7 (1802), and in the Fourth, Sixth, and Seventh Symphonies. However, it is possible that for the Fifth Symphony Beethoven originally preferred ABABA', but changed his mind in the course of publication in favor of ABA'. 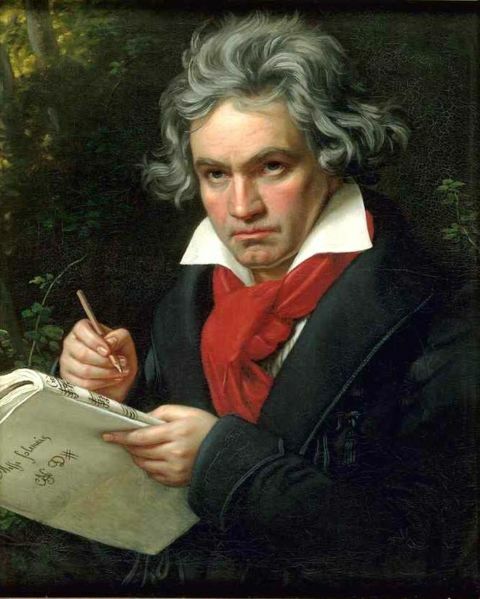 Since Beethoven's day, published editions of the symphony have always printed ABA'. However, in 1978 an edition specifying ABABA' was prepared by Peter Gülke and published by Peters. In 1999, yet another edition by Jonathan Del Mar was published by Bärenreiter which advocates a return to ABA'. In the accompanying book of commentary, Del Mar defends in depth the view that ABA' represents Beethoven's final intention; in other words, that conventional wisdom was right all along. Performances with ABABA' seems to be particularly favored by conductors who specialize in authentic performance (that is, using instruments of the kind employed in Beethoven's day). These include Brown, as well as Christopher Hogwood, John Eliot Gardiner, and Nikolaus Harnoncourt. ABABA' performances on modern instruments have also been recorded by the Tonhalle Orchester Zurich under David Zinman and by the Berlin Philharmonic Orchestra under Claudio Abbado. At this location, the theme is played in the key of E flat major. When the same theme is repeated later on in the recapitulation section, it is given in the key of C major. As Antony Hopkins notes, "this ... presented a problem to Beethoven, for the horns [of his day], severely limited in the notes they could actually play before the invention of valves, were unable to play the phrase in the 'new' key of C major. Beethoven therefore had to give the theme to a pair of bassoons, who, high in their compass, were bound to seem a less than adequate substitute. In modern performances the heroic implications of the original thought are regarded as more worthy of preservation than the secondary matter of scoring; the phrase is invariably played by horns, to whose mechanical abilities it can now safely be trusted." In fact, since Hopkins wrote this passage (1981), conductors actually have experimented with preserving Beethoven's original scoring for bassoons. This can be heard on the performance conducted by Caroline Brown mentioned in the preceding section, as well as in a recent recording by Simon Rattle with the Vienna Philharmonic. Although horns capable of playing the passage in C major were developed not long after the premiere of the Fifth Symphony (according to this source, 1814), it is not known whether Beethoven would have wanted to substitute modern horns, or keep the bassoons, in the crucial passage.